We’re excited to announce our feature performance on Sunday night, Kelle Jolly and The Band! Kelle Jolly and The Band are leaders in east Tennessee's music community who share their love of American music traditions with cool renditions of hot classics. They will bring you an unforgettable concert of soul-stirring music! bursts of courageous musical creativity. 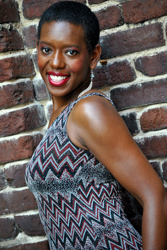 Kelle Jolly is a graduate of South Carolina State University in Orangeburg, SC, where she acquired a B.S. in Music Education. Kelle, along with her husband, saxophonist Will Boyd, have entertained audiences from here to Japan, performing, jazz, blues, soul, folk and gospel music. Since moving to Appalachia, she has added ukulele playing to her repertoire. She enjoys being an ambassador of American music traditions. Kelle Jolly is the 2011 Mountain Soul Vocal Competition Winner and the Knoxville Community Shares 2013 Artist of the Year. Kelle was blessed with the honor of sharing her voice for the 80th Anniversary of the Highlander Center.